About: Sweet Loren's is an NYC based company that has a portfolio of non GMO, gluten free, vegan, dairy free, and nut free cookie dough products. Sweet Loren's cookie dough can be found in the refrigerated dairy aisle of over more than 7,000 retailers across the United States. Sweet Loren's mission is to drive the clean revolution in baking. Current portfolio includes four insanely delicious flavors of Place & Bake Cookie Dough - Chocolate Chunk, Fudgy Brownie, Sugar Cookie, Oatmeal Cranberry - that come in convenient portion controlled packaging so you can bake as many cookies as you'd like at one time. Sweet Loren's also recently launched Edible Cookie Dough - Chocolate Chunk flavor - in a jar so easy to scoop to eat raw, or bake as cookies. More flavors coming soon. Founded by Loren Brill who beat cancer at a young age, searching for ways to satisfy her sweet tooth with clean ingredients, she started to make her own recipes. 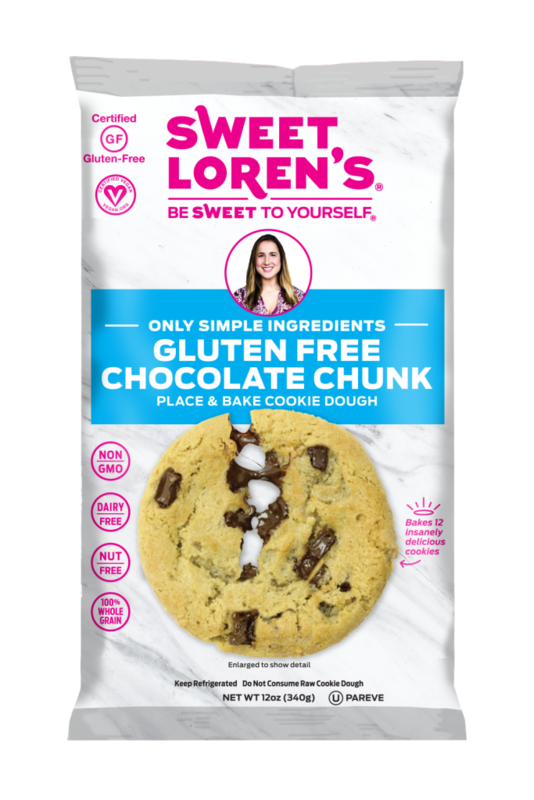 Sweet Loren’s now provides cookie lovers of all ages and dietary backgrounds, with delicious ready-to-bake and edible cookie dough products delivering on taste and quality. The Sweet Loren’s Brand Promise guarantees delicious, homemade taste and only simple ingredients, never chemicals. Check out Sweet Loren’s cookie dough products, they are non GMO, gluten free certified, vegan certified, dairy free, nut free, plant-based, 100% whole grain, and kosher parve. For more information, and to see scrumptious recipes you can make with Sweet Loren's cookie dough, head to sweetlorens.com. Follow Sweet Loren's @sweetlorens and tag Sweet Loren's with #besweettoyourself #sweetlorens.